STIB finalized its “Carbon & Energy Strategy” in February 2014, with projections reaching 2030. For this project, Climact, an energy & climate change consulting company, supported STIB. The results of the carbon balance concluded that in 2010, STIB greenhouse gas emissions were estimated at 170 ktCO2e, according to the chosen scope combining direct and indirect emissions. The rolling stock energy is the main source of emissions (42%). In the same year, the STIB energy bill rose to 32 M€, 75% for rolling stock and 25% for infrastructure. Following this carbon balance analysis, a projection of STIB’s emissions until 2030 was carried out, taking into account several influencing factors such as the transport provision (expected to double by 2030 compared to 2010), infrastructure extensions and human resources growth. 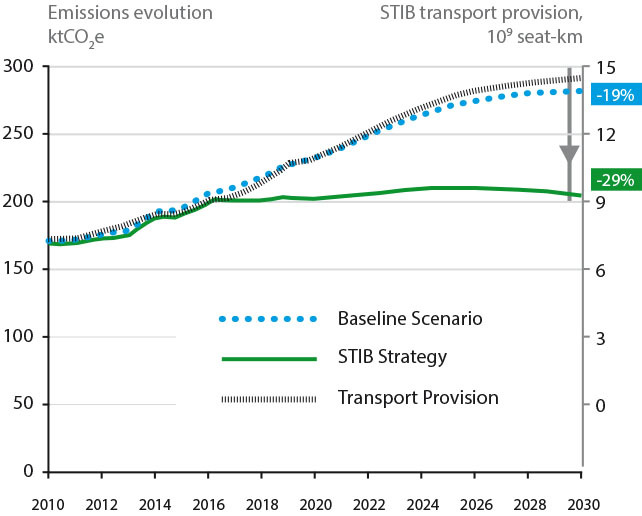 For the baseline scenario, in which technology remains unchanged and the doubling of the provision is integrated, STIB emissions rise to 285 ktCO2e in 2030, i.e. a yearly increase of 3%. The corresponding yearly energy bill would rise to 55 M€ in 2030 (44 M€ in 2017) with an hypothesis of constant energy prices and in the worst scenario, could even rise to 65 M€ in 2030. During the study, many actions have been identified with STIB experts to limit the CO2 emissions and energy costs. More than fifty concrete actions were selected, covering the rolling stock, buildings, purchases or renewable energy production equipment. A particular combination of these actions was chosen for the definition of an ambitious and realistic scenario. This scenario will reduce emissions by 30% and the annual energy by 25 M€ in 2030 compared to the baseline scenario, despite a doubling of transport provision. This scenario is ambitious but is capitalizing on commitments already made by STIB in its 2013-2017 management contract. The most significant actions are related to rolling stock, including the electrification of the bus fleet. Related emissions (direct and indirect emissions per seat.kilometres offered) will decrease significantly by 2030, from 24 gCO2/pl.km in 2010 to 14 gCO2/pl.km in 2030 (-40%). The financial impact of the scenarios was based on the assessment of investment, operating costs and energy bills. The additional investments required for this ambitious scenario are offset by the gains on the energy bill, making the scenario cost-effective by 2030.